A slots machine or slot in American English can be called fruit machine in Great Britain, simply the slots in Canada or even pokies as an Australian variation of the game. 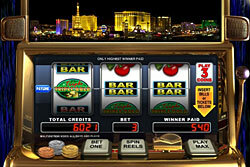 It is considered to be the gambling machine dedicated for money winning gaming. It is interesting to know about slots that they are also known in the history of gambling as the one-armed bandits due to the fact that the first slots had the lever on the right side instead of the spin button in the front and also due to their ability to leaving the gamblers penniless. Modern types of slots can consist of either three, five, or seven reels that spin if the spin button is pushed or the lever is triggered. The latest innovative slots offer the screens with the video reels displayed on them. The first USA slots machine was invented in San Francisco by the American inventor of German origin - Charles Fey. He managed to manufacture the machine that consisted of three spinning reels with the 5 total symbols depicted on them. The symbols were diamonds, horseshoes, spades, hearts and also the Liberty Bell symbol after which the Fey's invention turned out to be named. In such a way Fey managed to introduce the first self-paying gambling mechanism. The 3 Liberty Bell images guaranteed the max winning - ten nickels. Thus, Liberty bell gained publicity and became recognizable in wide gambling circles, notwithstanding the fact that gambling was banned. Still the mechanism was so popular that a lot of manufacturers had attempts to buy the author's rights to copy the machine and put it to the production on the line. Notwithstanding Fey's protests, Herbert Mills, from Chicago set the set serial production of slots called Operator Bells in his company. Speaking about slots today, it is essential to mention that they dispose the great variety of reels amount, winning symbol combinations and payment options. If the player manages to match the images on the reels, the slots provide payout by means of the cash, extra game, etc. In gambling centers of the USA like Las Vegas or Atlantic City there are a lot of slot variations available for the most inveterate players. Since the 1990s, multi-linear machines have become popular. Such slots have more than one line of payouts. Reel slots as a rule may have 3 or 5 lines of payouts. Speaking about the most up to date slot machines like video slots, they may have nine, fifteen, up to twenty five or even nearly 100 various pay lines.